Hen House slot machine is the ultimate fun, try it now! Imagine yourself in a nice big farm where incredible things can happen! You are the boss there, the farmer who has many things to do around the farm. Hen House online slot machine has 5 reels, 25 lines. In the background, you can see a nice view of the place. The graphics are stunning and nicely detailed. You can really feel like you are in the farm. As we mentioned, this henhouse is an exceptional place. You can find two progressive jackpots there, a MINOR and a MAJOR jackpot. The jacpots are triggered randomly. Play now and collect the eggs and jackpots. 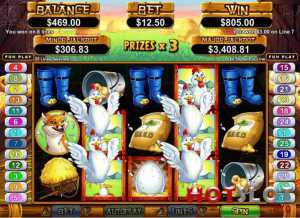 Hen House online slot is a totally farm-themed game with the following symbols: a rooster, a Hen House with eggs inside, the farmer with the nice hat, and a hungry fox who hunts for hens. A sheep and a pig can be found here, too. A huge pile of hay, a bucket with food for the hens, blue boots, and seeds will make a winning combination if you can spin 3 or more of them. The white hen is the Wild symbol and they appear on reels 2, 3 and 4. In addition, they substitute for all symbols except Scatters. Speaking of Scatters, that is a huge white egg. Hit 3 or more and the Scatter wins will be multiplied by the total bet. So, when you manage to spin 3 or more of this shiny egg, you will enter to a minigame. All you need to do is to select from the 9 hens which are in the henhouse, waiting for you. You can choose eggs, golden eggs, rotten eggs or a nice bonus symbol. In fact, 5 free games will be added, so it's a great opportunity to win a lot. How does the Hen House slot machine pick feature work? As you've been told before, you will see 9 hens. In the first round, if you can choose an egg, you will get three extra games and you have the opportunity to pick another one. However, when you pick a golden egg, you'll be instantly awarded with 5 extra games and you can enter to Round 2. What happens in Round 2, you may ask. Well, if you choose an egg, the multiplier will be increased by 1 and you can pick another hen. But if you choose a golden egg, the multiplier will increase by 2 and you can enter the last round. In Round 3, if you can see a Bonus symbol, it'll work like an additional substitute during the extra games. Don't forget that if you pick a Rotten egg, the feature ends. If you feel lazy, just activate the Autoplay feature so the reels will spin by themselves. Isn't it cool? Go for the eggs, collect them and you will surely be a very happy casino player! For all the combinations and paylines, check the Help section. Good luck, dear farmer and hope for the best!